First photo shoot with my new hip! In younger days I was quite passionate training in wrestling and karate. Part of the regime was running. I loved to ski as well. Almost 20 years ago I felt some stiffness in my hip. Thinking it was stubborn tendonitis I went to a doctor to have it checked out. Unfortunately the diagnosis was early onset of arthritis, which I have been living with since. I traded in the dojo for a swimming pool and the running shoes for a bicycle. For the past 3 years pilates has kept me in good shape. After a visit to my doctor in June, we decided it was time for a change, and scheduled replacement surgery for December 11, 2014. My work schedule slows down around the holidays. I let my clients know I would be out for 5 weeks and tried to schedule shoots the best I could. I lost a couple of jobs, but not too bad. I was dreading surgery up until I was sitting in the operating room, hooked up to an IV, and the anesthesia knocked me out. When I woke up in recovery I was very happy I had it done and looked forward to recuperating and a better quality of life. It has been 5-1/2 weeks since surgery. I have been doing physical therapy every day trying my best to get back to work. Yesterday was my first shoot. I was nervous that I would start feeling sore and the joint would fatigue. I felt great! It was nice to get back into the studio. The job was demanding and I felt no pain or tightness. I am looking forward to full recovery and of course more work! If you need a new hip, Dr. Roy Davidovitch is your man (NYU Hospital for Joint Disease). If you want to see an animated video of the procedure, check out this link. Pretty crazy. Here is some behind the scenes from yesterday’s shoot for Alice and Trixie. Robin Buss of Muse NYC was our gorgeous model. 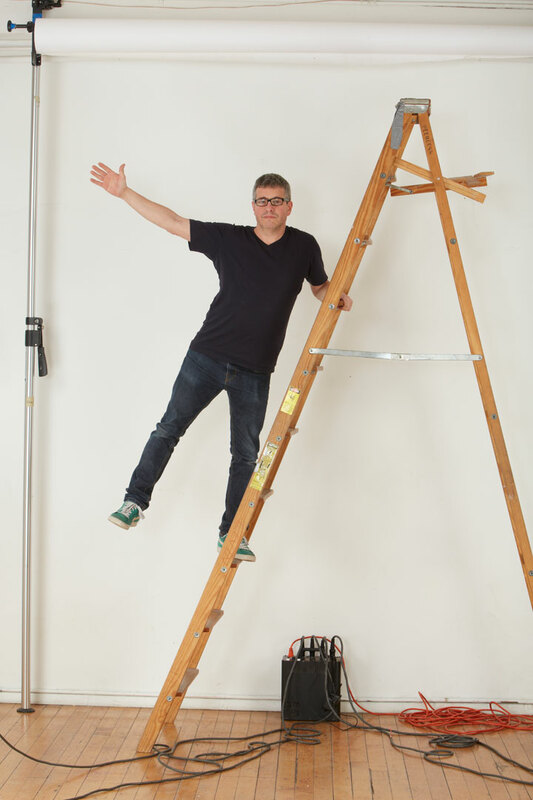 The last photo of me on the ladder was taken by my assistant at the end of the day! → Great photographers wear glasses!